Calvary Training Center cordially invites you to participate in it’s Inaugural Imperial Beach 5K (IB5K) on Saturday June 25, 2016. 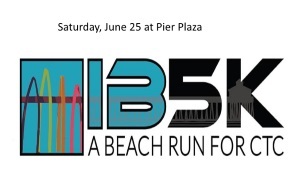 "IB5K - A BEACH RUN for Calvary Training Center,” is a 3.1 mile TIMED and MEDALED RACE which will take place at Pier Plaza on Seacoast Drive and Elder Avenue in sunny Imperial Beach, California. "IB5K," Calvary Training Center will be able purchase new training programs for their students, obtain much needed supplies for the surrounding areas families, and replace worn beds and bedding for the missions base to continue in the next 20 years. Calvary Training Center reaches out to hyper-impoverished neighborhoods and establishes better relationships with not only the the families in great need directly associated with their base, but also to go further into the missions fields of Central and South America. The Calvary Training Center is based in La Gloria, Mexico and they specialize in training young adults to become missionaries. great way to give back to the training center’s goals of reaching the needy and impoverished. The after event “EXPO “ will have GREAT food, jumpers for the KIDS, LIVE MUSIC and MUCH more! The hope is that this race will prove to be the beginning of an exciting tradition and family fun filled day for the residents of Imperial Beach to help the families of those hyper impoverished areas Calvary Training Center serves. The Calvary Training Center is looking forward to working with the community of Imperial Beach and all of San Diego County in this endeavor, recognizing that this opportunity offers everyone a chance to say “THANK YOU” for their own gifts by offering to serve and give back to others in need. Currently Big 5 Sporting Goods, Dam’es Spa, and Thrivent Financial are some of the initial IB5K sponsors. Event registration for RUNNERS is NOW OPEN at active.com or for further information on how you can sponsor or volunteer for this event and be included in all promotional opportunities available, please contact Annabelle Vergiels, IB5K Race Director, 702-217-9044. Calvary Training Center is a 501(3)C non profit organization and a Ministry of Calvary Chapel Spring Valley.